UPDATE: 2/3/16. Unfortunately, according to people within the organization, what happened to Claire could happen again today — nothing has changed to prevent it. Those same sources believe that nothing will change until a new board exists and that board is able to look at this issue with fresh eyes. This is despite a fairly simple fix: In the existing employee handbook’s description of employee discipline, substitute the word “and” for the word “or” in between their written options. It is because CGW does incredible work and has a great many quality people involved in that work that we remain hopeful that the organization will improve its way of communicating with its employees at some point in the future. We fear that anything less will gradually degrade the organization and its ability to effectively do their good work in our community. Historical details follow for those who are interested. Thanks for answering the call and signing the petition we posted back in May. At that time we were all struggling to understand why Claire Strader had been removed from her job as Community GroundWorks (CGW) Farm Director and it seemed to us that something was wrong at Troy Gardens. From what we’ve learned, we believe Claire was dismissed due to personality conflicts rather than job performance issues, which is, of course, deeply troubling. Along with other evidence, Claire’s sparkling performance evaluation from Spring, 2012, supports our conclusion. From what we’ve learned, we believe the personality conflicts which led to Claire’s forced resignation were never addressed in any systematic, documented way, and this lack of professional support for Claire preceding her forced resignation is also deeply troubling to us. None of the steps listed in the employee handbook seem to have been followed after Claire was formally advised that there were problems. Members of the CGW Executive Committee (EC) did not respond truthfully to some of our questions at the May 20th meeting and committed what we see as ethical breaches in attempting to limit community input and counter our assertions regarding Claire’s departure. We feel these behaviors are completely unacceptable and that the EC should either resign or be removed by the remainder of the Board. However, we don’t believe the EC feels they have done anything wrong and we believe the remaining board members generally support the EC and believe what they have been told by the EC with regard to Claire’s dismissal. Thus, there is little chance that the EC will resign or be removed. The farm generated 45% of all CGW revenue last year ($191,000 out of $423,000). For comparison’s sake, farm revenue makes up only about 10% of Milwaukee-based Growing Power’s income; the vast majority of their revenue comes from grants and donations. A sophisticated analysis of revenue streams and functional expenses would likely show that the farm is, in fact, carrying Community GroundWorks. This just adds another irrational aspect to firing Claire. She was dismissed for (unknown to us and un-perceived to her) personal conflicts with board members and (supposedly) EDs, while her work helped ensure the organization’s solvency. Despite the Farm’s importance to the organization’s revenue stream, the farm hardly figures into the Board’s discussions based on what the board talked about at their June 17th meeting. 2) Volunteer to serve on the board. One of our group’s members, Maury Smith, submitted his application to join the board at the June 17th meeting and another member of our group is considering doing the same. The board currently has 11 vacancies, and several sitting members will see their terms expire later this year. If any of you have an interest in serving on the CGW Board, we would welcome your service! That’s by far the best way to get involved and make a difference. 3) Continue to act as organizational watchdogs and advocates for CGW staff. Now that we know as many of the facts as possible, it is time to re-share the revised petition page with others so they can indicate their support for these issues. This will also allow us to provide a more effective watchdog role. 4) While apparently not required by its by-lays, we hope the CGW board takes steps to ensure that the CSA Farm Representative position on the Board is actually elected by CSA members. As far as we can tell, no CSA members, except for Gerianne Holzman, had any input regarding Claire Strader’s performance and her dismissal as Farm Director. Here you’ll find the five questions we asked at the May 20th meeting, the EC’s answers to those questions, our reply to those answers, and a timeline record of events that we have pieced together relevant to Claire’s forced resignation. If you have any questions or if you’re interested in more details we can supply you with what feels to us like an infinite amount of additional information. We have learned so much about how the EC handled the events leading up to Claire’s forced resignation, but we’ll refrain from burdening readers with that kind of overload. We’re happy to announce that Claire has accepted a position in Des Moines where she started work in July. She’ll live in Iowa during the week and Madison on the weekends. We would also like to invite you to a celebration on Saturday, August 24th (invitation here), in honor of Claire’s 12 years of dedication to the Troy Gardens CSA farm. Again, thanks for your attention and support, please consider serving on the CGW Board, and let us know if you have questions. We hope to see you August 24th at Claire’s celebration! If you have not already signed this petition, do so now. Something is Still Wrong at Community GroundWorks! Dear Friends, Thanks for answering the call and signing the petition we posted back in May. At that time we were all struggling to understand why Claire Strader had been removed from her job as Community GroundWorks (CGW) Farm Director and it seemed to us that something was wrong at Troy Gardens. Since then our group has gathered information from CGW Board members and others close to the organization, we have attended a charged CGW Board meeting on May 20 at which we asked the board to respond to five important questions, we have received answers to those questions and we have met to discuss the board’s answers. After all of that, it still seems to us that something’s wrong at Community GroundWorks. Here’s why we feel that way: From what we’ve learned, we believe Claire was dismissed due to personality conflicts rather than job performance issues, which is, of course, deeply troubling. Along with other evidence, Claire’s sparkling performance evaluation from Spring, 2012, supports our conclusion. From what we’ve learned, we believe the personality conflicts which led to Claire’s forced resignation were never addressed in any systematic, documented way, and this lack of professional support for Claire preceding her forced resignation is also deeply troubling to us. None of the steps listed in the employee handbook seem to have been followed after Claire was formally advised that there were problems. Members of the CGW Executive Committee (EC) did not respond truthfully to some of our questions at the May 20th meeting and committed what we see as ethical breaches in attempting to limit community input and counter our assertions regarding Claire’s departure. We feel these behaviors are completely unacceptable and that the EC should either resign or be removed by the remainder of the Board. However, we don’t believe the EC feels they have done anything wrong and we believe the remaining board members generally support the EC and believe what they have been told by the EC with regard to Claire’s dismissal. Thus, there is little chance that the EC will resign or be removed. The farm generated 45% of all CGW revenue last year ($191,000 out of $423,000). For comparison's sake, farm revenue makes up only about 10% of Milwaukee-based Growing Power's income; the vast majority of their revenue comes from grants and donations. A sophisticated analysis of revenue streams and functional expenses would likely show that the farm is, in fact, carrying Community GroundWorks. This just adds another irrational aspect to firing Claire. She was dismissed for (unknown to us and un-perceived to her) personal conflicts with board members and (supposedly) EDs, while her work helped ensure the organization's solvency. Despite the Farm’s importance to the organization’s revenue stream, the farm hardly figures into the Board’s discussions based on what the board talked about at their June 17th meeting. Because it’s now clear that Claire will never be rehired at Troy Farm and that the EC will remain in office, we feel our group’s goals should be to: 1) Work with the CGW Board to establish a committee to improve communications between staff, community and the board. We salute the board for its willingness to form this committee; 2) Volunteer to serve on the board. One of our group’s members, Maury Smith, submitted his application to join the board at the June 17th meeting and another member of our group is considering doing the same. The board currently has 11 vacancies, and several sitting members will see their terms expire later this year. If any of you have an interest in serving on the CGW Board, we would welcome your service! That’s by far the best way to get involved and make a difference. 3) Continue to act as organizational watchdogs and advocates for CGW staff. Now that we know as many of the facts as possible, it is time to re-share the revised petition page with others so they can indicate their support for these issues. This will also allow us to provide a more effective watchdog role. 4) While apparently not required by its by-lays, we hope the CGW board takes steps to ensure that the CSA Farm Representative position on the Board is actually elected by CSA members. As far as we can tell, no CSA members, except for Gerianne Holzman, had any input regarding Claire Strader’s performance and her dismissal as Farm Director. Here you’ll find the five questions we asked at the May 20th meeting, the EC’s answers to those questions, our reply to those answers, and a timeline record of events that we have pieced together relevant to Claire's forced resignation. If you have any questions or if you’re interested in more details we can supply you with what feels to us like an infinite amount of additional information. We have learned so much about how the EC handled the events leading up to Claire’s forced resignation, but we’ll refrain from burdening readers with that kind of overload. We’re happy to announce that Claire has accepted a position in Des Moines where she started work in July. She’ll live in Iowa during the week and Madison on the weekends. We would also like to invite you to a celebration on Saturday, August 24th (invitation here), in honor of Claire’s 12 years of dedication to the Troy Gardens CSA farm. Again, thanks for your attention and support, please consider serving on the CGW Board, and let us know if you have questions. We hope to see you August 24th at Claire’s celebration! Sarah Luetzow, Lily Hoyer-Winfield, Todd Cambio, Marcia Yapp, Jim Powell, Maria Powell, Donal MacCoon, Emily Sanford ------ [Original version] Something is Wrong at Community GroundWorks! In a head-scratching move, the Community GroundWorks (CGW) Executive Committee made our CSA farmer Claire Strader leave at the beginning of the farming season and won’t let anyone talk about it, including Claire. To get rid of our award-winning, founding, CSA “White House Farmer” at the beginning of a new season is bizarre and does not bode well for the CSA. But to do it without transparency is even worse…and does not bode well for CGW. What happened to CGW’s mission & values? (1) The Executive Committee has dishonored our community by refusing to answer calls for open and transparent communication under the guise of protecting Claire, a claim that is not credible for those who know her (2) The Executive Committee has dishonored core values of CGW “We are committed to collaborative decision-making. We partner with and support the efforts of others who share in the work of building enduring communities.” (CGW Mission & Values, as of 5/5/13) (3) The Executive Committee is not holding itself accountable to community members and staff I have signed this petition to urge the current CGW board to return to transparent communication and the values of CGW. Don’t forget to share your stories, support, and testimonials with Claire for 12 years of amazing dedication and hard work (do this by adding a comment below). Also, please note, you can add a comment in support of Claire without signing the petition. That is, adding a comment does not necessarily imply that you are in support of the petition. 6/16/13 UPDATE: We received answers to our 5 questions on 6/4/13 and met tonight to discuss them. We are currently working on a response. 5/21/13 UPDATE: About 20 friends of Community GroundWorks met with the board on May 20th. The original authors of the petition (see below) submitted five requests in writing to the board. The board agreed to respond in writing within 2 weeks (by June 3). We are waiting for this response. In the meantime, keep signing and commenting. Something is Wrong at Community GroundWorks! In a head-scratching move, the Community GroundWorks (CGW) Executive Committee made our CSA farmer Claire Strader leave at the beginning of the farming season and won’t let anyone talk about it, including Claire. To get rid of our award-winning, founding, CSA “White House Farmer” at the beginning of a new season is bizarre and does not bode well for the CSA. But to do it without transparency is even worse…and does not bode well for CGW. What happened to CGW’s mission & values? (1) The Executive Committee has dishonored our community by refusing to answer calls for open and transparent communication under the guise of protecting Claire, a claim that is not credible for those who know her. Action: What You Can Do? 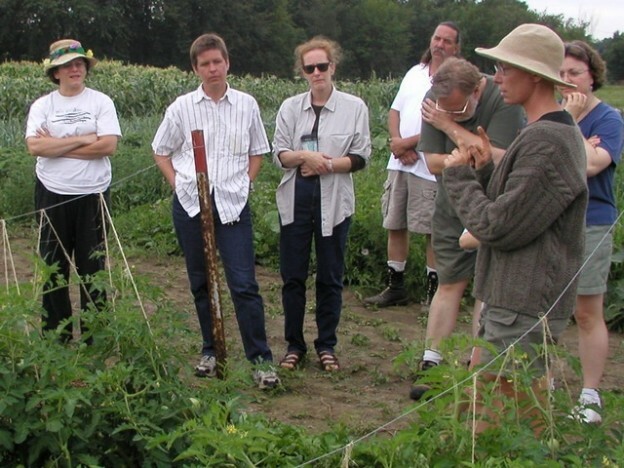 When the farm was struggling to decide whether (and how much) to spray their tomatoes, Claire always kept us CSA members in the loop, communicating the farm’s entire process. This is just one of the many positive memories I have of Claire and her transparent, open, communication. Claire has taken farming and educating – two of the most challenging jobs out there – and blended them into a highly successful urban farm and internship that serve as a model for others around the country. Always passionate, humble, dedicated, and honest, she has been an inspiration to me and many others who have been lucky enough to work with her. I understand confidentiality agreements, but I think some disclosure is necessary. We are left to speculate. It is not fair to any of the parties involved. When I would pick up my vegetables Claire would always greet me with a smile, and recognize my presence. I know farming is hard work, but the rest of the folks at the stand looked so grim and barely even made eye contact as I filled my bag. Not sure what that was about. These are intern comments (including my own) taken directly from the CGW website. I believe I speak for the intern class of 2012 in stating that Claire is a magnificent farmer, teacher, and mentor. I live across the street from the garden and am very proud of my address. I am not a gardener but I am a vegetable eater. I spent the summer of 2012 as an intern at Troy working for Claire. I came into the experience with very little hands-on experience in farming. Claire, Jake and Julie have dealt with those like me before; they don’t seem to have any problem taking things back to brass tacks, starting from the basics, and building up foundational knowledge from day one. This is one of the things that I think is unique about Troy; everyone understands that with a bit more time spent on the front end educating everyone about the importance of each task, the work gets done better and more efficiently, hopefully in the end making up for the time lost in training. In these ways, learning both by doing and by observing, I learned an extraordinary amount during the course of the year, but my eyes were also opened to all that I had yet to learn, and to the great complexity of organic CSA farming. It is a humbling experience, but exciting, like learning your first song on the piano, understanding that perfecting this skill will be a lifelong endeavor. Learning at the farm was at its best when there was sufficient time with of the farm managers doing the task with the interns that there was ample time to fully discuss and understand why a particular task was important to the success of the crop or the farm. This wasn’t always possible, but it was much more common than it would be in most typical farm work settings. Without this understanding, it is easy for some tasks to lose their luster and feel like a waste of effort. Claire was excellent at communicating with interns about why we did what we did. The other element of pedagogy that was very successful was the increasing responsibility given to the interns as the year progressed. The additional responsibility was very motivational; the possibility that we might lead a crew in performing a particular task was a big motivator in ensuring that we fully understood what we were working on. Claire does a great job striking a balance between giving too much instruction and too much responsibility. I am starting a small farm, and the planning tools and general farming knowledge that I picked up from Claire have been extremely helpful to my efforts. Being an intern with her was both empowering and humbling, and has caused me to be more cautious and methodical about starting out on my own. I am extremely grateful Claire and the other managers at Troy for being so open and honest with us interns, and for being such good teachers and motivators. I really valued my time at the farm, and will always remember both the lessons that I learned, and the friends that I made. Claire is such a gift to this community. I was shocked to hear that she would would be leaving the farm. As others have said she was a farmer and a teacher and an incredible manager. She knew what needed to be planted and tended when and she was able to oversee large groups of volunteers and workers to make sure the jobs were done. So many of us have worked with Claire and eaten the fantastic produce that she has helped grow. Thank you Claire for all you have given and all you have meant in our lives. I was thoroughly excited to accept a second year internship offer from the Troy Farm director at the time, Claire Strader, for this current 2013 season. I wanted to share a couple of the reasons why I applied for the second year internship in the first place. First and most importantly, I wanted to spend another year learning from Claire. Community GroundWorks and Troy Community Farm were very lucky to have such a hardworking, dedicated and locally engaged farm director. She has so much experience and knowledge with organic farming practices to share, and was more than willing to share this with aspiring farmers through the internship program. Since the end of the 2012 season and completion of my first year internship, I have been anxiously awaiting to get back out on the field with Claire, because I felt like I had so much more to learn from her. Another reason why I applied for the second year internship was to have another year of experience with Troy Community Farm in order to familiarize myself more with the Community GroundWorks organization and the employment opportunities within it. Claire always spoke highly of the projects different departments were working on and the direction the non-profit organization was heading in. I noticed Claire was consistently looking forward with projects to benefit both the farm and the organization as a whole, and this was very inspiring to see. Upon hearing the news of Claire’s departure, I couldn’t have been more confused with the situation. I know Claire would not leave Jake, Julie and the farm voluntarily at such an inopportune time. There is not a day that goes by on the farm that I don’t think about and miss Claire. This is such an unusual way for this to be handled. It is just so strange. People should be able to talk about and understand such a significant event in our community. I have been a member at Troy Gardens CSA since, I believe, 2009. It has been a great experience. I have always found Claire’s newsletters to be informative–they have given me a lot of insight and appreciation for what goes into the whole process of farm-to table. The produce has been very high quality and also very clean. When I’ve had questions, Claire has answered them promptly and has always made me feel that as an individual member, my thoughts and opinions are important. I would not be the farmer I am today if it weren’t for Claire. I came to Troy in 2009 with no farming experience whatsoever. Claire’s hands-on, facilitative approach to farming education gave me a solid foundation in the principles of organic farming. Now, I’m in my fifth season as a farmer, working at Harmony Valley Farm in Viroqua. I continue to reference every aspect of what she taught me in my three seasons there. She was always very fair and positive with all the interns. I can’t really imagine Troy Farm without her.